Who Will Survive the Death of the Newspaper Industry? NPR's CEO Gary Knell says that no one under the age of 30 has read a paper, and they never will. The days of reading the printed paper at breakfast or the tabloids on the bus and subway are disappearing as media consumption on digital devices evolves. 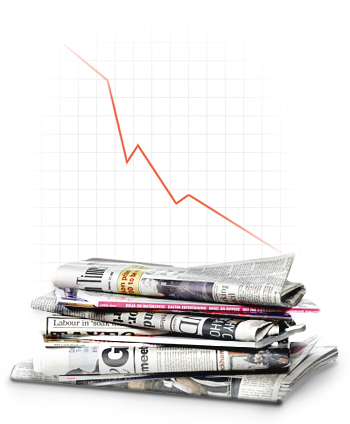 Newspapers have recently seen a massive decline in advertising revenue. With new advertising venues available and many businesses struggling through the recession, advertisers simply aren't paying like they used to. One third of newspapers' traditional revenue has vanished because classifieds for job positions, home sales, apartment rentals, second-hand cars, etc. are disappearing to internet giants like Craigslist, Ebay, and Monster.com. Warren Buffett believes in small-town newspapers. The future looks bleak for newspapers. However, if you're a small to medium size local newspaper, we have good news for you. There is hope. Throughout this page we will share strategies for helping your newspaper to prosper during this challenging transition time while other papers wither away. Despite the nation-wide decline, we believe local newspapers can not only survive, but thrive. Warren Buffett believes it too. Warren Buffett's Berkshire Hathaway just bought 63 daily and weekly newspapers scattered throughout the U.S. Southeast for $142 million in cash. Buffett intentionally bought small-town local newspapers, clearly recognizing their potential at a time when few others do. It's well known that Berkshire Hathaway doesn't fool around and won't waste time with anything where they're going to lose money. Newspapers are dying, but journalism is growing like never before. Technology is spreading information and transforming the way people consume news. Now that so many people read their news online, newspapers are seeing a major drop in the number of readers who buy the printed paper. Printing information on paper once a day and throwing it on everyone's doorstep is no longer the most efficient means of distribution. Young people simply don't read the paper, nor will they in the future as digital devices such as smart phones, tablets, e-readers, and personal computers have become the most convenient option for an evolving mobile generation. Not only is media consumption evolving, but the explosion of blogs and social networks like Facebook, Myspace, and Twitter, has also caused news to evolve. There has been a shift from news as a "product", to news as a process. Smartphones make it possible for anyone to share and publish breaking news from out in the field and provide continual up-to-the-minute information. News can reach people today far faster through the Internet than the printed paper. Embrace the Internet Revolution...Just Do It Right. For a reason that we're not yet sure newspapers, at some point in the past, decided to give away their product for free on the Internet assuming that somehow, someday, this would make them money. It did not. Newspapers have always had multiple streams of revenue to support themselves and the future will be no different. But that doesn't mean the money-making models newspapers will use on the web will look the same as the ones they have used for print. Simply dumping content online and making money from advertisements placed on the websites is not enough. Most Newspapers are treating their websites as an afterthought because their advertising revenue is still largely coming from print. The fact is, the shift to getting more revenue from websites won’t happen until the websites are the first priority. The mobile movement with phones and tablets is the most exciting development of a new medium since the Web itself. But simply having a presence on these devices is not enough. Mobile technology represents a whole new opportunity to engage readers and share news in new ways. There are exciting new possibilities at your fingertips, but it's essential that you embrace these technologies wisely to guarantee income and not risk giving away your content for free. Even though a focus on your Internet presence may not have an immediate positive impact on your bottom line, you need to embrace it or you will be left behind. Most papers have tried to monetize their online readership with advertisements. In nearly all cases this has failed miserably. Newspapers have failed to recognize that the digital advertising model is not the same as the print advertising model. According to a recent forecast by eMarketer, for the first time in history, U.S. online advertising is expected to outpace total spending on print advertising. There is money in digital advertising, newspapers just haven't figured out how to tap into it yet. The print world and web world are different worlds and cannot be treated the same. If done correctly, newspapers CAN make money with online advertising, but not as easily as print advertising during the golden years. With the recession and a rapidly expanding range of options, advertisers just aren't willing to pay like they used to. Since online advertising competition is so high, newspapers can't expect ads to profit as they once did. For those who embrace technology properly, however, there actually are some things you can do to increase your value for advertisers and, accordingly, increase your revenues. We'll reveal more about that throughout this page. So with advertising revenue being so unreliable, how do newspapers guarantee income? What we (newspapers) had was a sort of suicidal form of economics, that is - giving our journalism away for free. Newspaper readership continues to run at all-time highs as the business model crumbles. It's time to readapt your business model a bit. The first step is charging for online access. If advertising worked, you wouldn't need to charge for a subscription. But with online advertising being so unreliable, a back up plan is critical. Hence, the importance of a paywall. Paywalls are the biggest new source of revenue for newspapers. Paywalls not only provide a revenue stream for your business, they also reflect changing consumer trends in how we make purchases. Consumers are quickly becoming more acclimated to the idea that not everything online is free. From streaming television and movies, music, premium blogs, educational communities, and exclusive subscription based resources, people are accustomed and willing to pay for quality content online. “There’s no question that we all have embraced paying for a variety of digital content that 10 years ago we did not pay for,” says Emily Smith, SVP of Digital at the Los Angeles Times. Ken Doctor, a news industry analyst and the author of Newsonomics, predicts that industry-wide, 20 to 25 percent of daily newspapers will have erected some form of paywall by the end of 2012. As The New York Times has demonstrated, many newspapers have actually been able to raise their advertising rates since charging for digital access. The people most likely to pay for a paywall, the dedicated readers, are the ones who are worth the most to you. Newspapers have been finding that the engagement among these subscribers is of a higher quality. After all, people least likely to pay aren’t worth as much to you or your advertisers. Advertisers get a more engaged audience, which is what they're signing up for in the first place. By requiring paying users to register, papers can also gather more information about their reader, allowing for more targeted, smart advertising. This intelligent advertising is hugely significant at a time when print advertising is the lowest it has been in 60 years. Behavioral and contextual advertising are becoming more valuable, and can be utilized even greater by introducing sub-editions or deeper local coverage that is hyper-targeted. This is the future of advertising and is exactly what advertisers are after. Despite the initial controversy, the New York Times has experienced great success with its paywall. Their success continues to bring attention to the future of the subscription model online. Since launching its paywall a little over a year ago, its daily circulation jumped a massive 73.05 percent over the previous year to 1,586,757. Three of the papers with the most significant Sunday circulation gains charge for digital content. That group includes not just the Times but also the Dallas Morning News and Newsday. Another success story, the Financial Times, which launched a paywall back in 2010, has reached 267,000 digital subscribers and gets 47 percent of its revenue from the digital side of its operations. The Audit Bureau of Circulations reports that overall, digital circulation has grown 63 percent this last year and now accounts for 14.2 percent of newspapers’ total figures, up from 8.66 percent a year ago. I can't say anything bad about the paywall. I think it's been the best thing, or one of the best things, we've ever done… It has been so successful for us that I can't believe everybody hasn't been doing something like this. Since implementing a paywall, traffic on Concord Monitor's website has remained steady and revenue has grown. Furthermore, by offering web access as an add-on, print circulation has gone up. [Advertisers] are getting a more engaged audience, which is what they're signing up for in the first place. Collington says the paywall has exceeded all expectations and that online advertising revenue has increased year over year. You should be proud enough of what you do to ask people to pay for it… If [newspapers] hadn’t made that fatal error 15 years ago of not charging for the content, we wouldn’t be in the mess [we're in]. The AllNovaScotia website went behind a complete paywall, with no free content. Despite some doubting the paywall, subscription revenue has been so overwhelmingly successful there was no need for advertising. They have since chosen to feature a small number of advertisements - just because they can. When Doesn't the Paywall Work? There's no denying, the paywall concept has been fraught with controversy. There are people on both sides of the issue, one group passionately praising its success, the other other group opposing it and predicting it's failure. So who's right? They both are. The paywall IS saving countless papers around the country and is thriving, but the paywall IS NOT right for everyone. The mass-broadcasting model just doesn’t work well on the web. The super large newspapers that cover world news face the inevitable future of world news being lost to the web. Thus, a paywall is not necessarily practical for international news since it can be found freely on countless websites. Some large newspapers are also struggling because their content is being republished on other news aggregate websites, thus robbing them of Internet traffic. It's unreasonable to imagine consumers paying for content they can find elsewhere for free. But, readers will pay for exclusive content, valuable news analysis, features, opinions, and video. The paywall alone will not save newspapers, but it is an integral part of the future of journalism. While national and international news will be taken over by the Internet, local news remains in high demand. Local newspapers can still maintain control of the supply and demand for local news. Both small and moderate sized newspapers will always have a dedicated readership and do not share the same dangers as the mass-reporting papers, and for them paywalls have proven exceptionally effective. Furthermore, as a community paper, by protecting your content and keeping it exclusive, you remain a sole source of high traffic in your community and thus can continue charging well for advertising. The relatively small Arkansas Democrat Gazette has used its paywall to cut off circulation losses on the print side and save its business. Warren Buffett recently paid $142 million for 63 daily and weekly newspapers scattered throughout the U.S. Southeast. 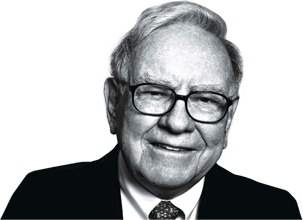 Buffett knows that small-town local newspapers still have enormous potential to generate considerable profits. There are many strategies for ensuring you experience maximum success with your news website. There are numerous paywall options you may want to explore and some essential strategies for establishing a quality journalism site. News is no longer a product, but a process. Online news articles can be updated with up-to-the-minute breaking news. You can get news to people faster through the Internet than the printed paper. Until you make the web your focus, you can't expect it to do great things for you. The web is the future, it's time to make it the focus. Daily news summaries sent to email are a FANTASTIC way to keep readers coming back to the site day after day. The mass-broadcasting model just doesn’t seem to work as well on the web. Diving deeper into local coverage and creating sub-editions creates targeted markets that advertisers love. Newspapers need to stop treating their websites as a dumping ground for print stories and treat each somewhat independently, carefully selecting the stories better suited for each medium. The physical newspaper can focus on less time-sensitive news and instead on more analytical stories as well as adding context to news that has been posted, shared and retweeted online. Use online access to the paper as a perk for all subscribers and an added incentive to purchase the physical paper. Since implementing a paywall on the Concord Monitor's website, traffic has remained steady and revenue has grown. Furthermore, by offering web access as an add-on, print circulation has gone up. Classified have moved to the internet. Places like Craigslist and Ebay have taken over. However, for the smaller cities, the community newspaper is still the best place for finding local classifieds. It's essential these classifieds be published online as well. Take advantage of being a local hub and build a lively classified section online. A lot of the social media news accounts are used like RSS feeds without any interaction with the audience. This is not enough. Social media can be a great tool for earning trust with your audience. Value your readers and use social media to build community and increase influence. Provide value worth paying for. Mediocre journalism or content that can be found free elsewhere is not worth a reader's money. Your paper must be remarkable. You have complete control over what goes behind the paywall. Determine if it's best to go with a total lockdown of your content or only a partial or metered lockdown. Let readers sample your online paper by allowing them to read several articles for free. You can determine the number articles readers can access freely before being urged to purchase a subscription. Sometimes a reader will want to share an article with friends and family that live out of state or don't have a subscription. This allows them to essentially buy access for the day. Breaking news stories are usually huge traffic generators for any site. The digital world makes it easy to provide up to the minute news updates for breaking stories. Convenience is one key to connection and news habits. 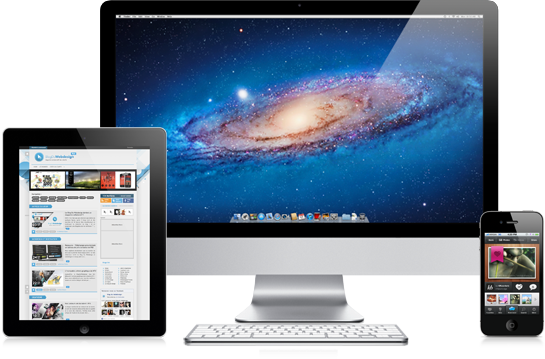 Make your site easily accessible on all devices. We know that though the newspaper industry itself is shrinking, the public's appetite for journalism is only growing. Newspapers are in a transitional phase still figuring out the proper economic and journalistic models necessary to shift from old technologies to new technologies. Those newspapers that survive and thrive will embrace the benefits of the digital world. One benefit of going digital is the increase savings as the cost of printing and distribution of the printed paper is gradually replaced by the nearly free distribution of digital subscriptions. At the Star Tribune, the 14,000 people paying about $100 a year for a digital subscription to the paper are bringing about $1.4 million in annual revenue. Publisher Michael Klingensmith says that without printing and distribution costs, more of that revenue shows up in the bottom line. Since the Star Tribune began charging for full access to the website, the website's page views declined only about 12%, meaning the revenue from new digital subscriptions exceeds revenue lost from declining traffic by 15 times. "I would make that trade all day," Mr. Klingensmith said. Newspapers will need to be very intentional through this transition phase by basically doing what Warren Buffett has told his own company's papers to do: "take on no debt that makes them vulnerable, expect to charge for online content somehow and make sure an intense local focus is in their DNA." The future holds many exciting opportunities for newspapers and it's only a matter of time before subscriptions based content becomes the norm online. Pigeon is the answer for doing it right. Pigeon is a paywall plugin that we've developed to work with your existing website. Pigeon offers you a pain-free way to setup a paywall and offer paid access to your content. Pigeon is flexible and built with a wide variety of paywall types in mind. 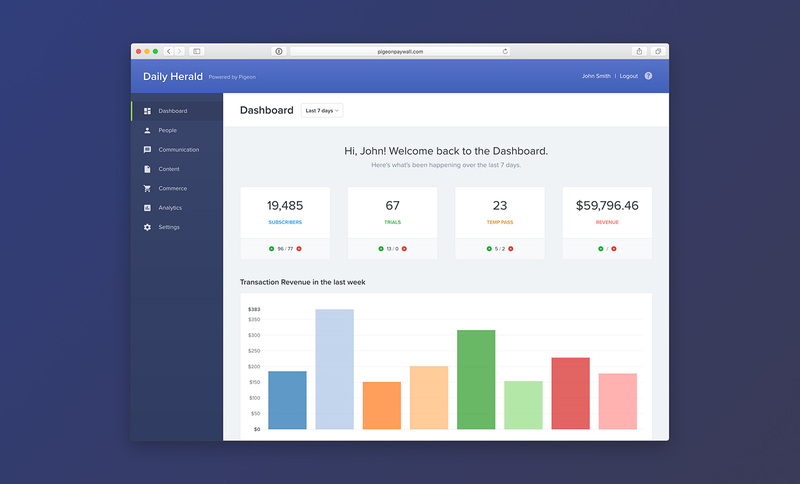 It provides your customers with a simple, beautifully designed interface for managing their account settings as well as an administration area for you to manage customers and generate reports. We built Pigeon with a simple installation process that let’s you activate the paywall fast, without having to spend time and money redoing website architecture. After configuring the paywall, we drop in a few lines of code and the paywall is live! Unlike other access methods that allow visitors to “break the paywall”, Pigeon has a few extra tricks up its wing and the paywall can’t be disabled by a website visitor. Whether you want to lock down all content or provide metered access, whether you want to offer subscriptions or one-day passes, Pigeon is highly flexible and has you covered. Seamless integration with your existing website and CMS. Straight-forward login process for existing subscribers. Simplified and beautiful sign-up process for new subscribers. Streamlined account management for existing subscribers. A beautiful admin interface for managing customers and responding to support requests. Access can be purchased by subscribers from around the world. Subscriber payments processed in minutes and deposited directly to your account. Daily or weekly email digests can be managed and delivered to subscribers. We install Pigeon and configure it to restrict access on a complete or metered basis. Your visitors are then redirected and prompted to create an account or log in. Pigeon connects payments directly to your merchant account via a variety of gateway options. The money stays in your control. Logged in customers manage their account settings via the secure customer portal, branded to your website (e.g. my.yourdomain.com). Pigeon offers you a simple and beautiful interface for managing customer accounts along with detailed reporting. Companies with a primary focus on digital content like online news sites, blogs, special interest sites, on-demand or digital download sites. *Soft paywall (metered) or registration-only scenarios may incur an impression fee for high-volume sites. Contact us for further detail. We charge a one-time fee to setup Pigeon and provide training to your team. After initial setup, a flat monthly fee provides continual access to the paywall service and our fantastic support team. The heart of Pigeon’s success is that we make money as you make money through a small transaction fee. *Contact us for volume discounts. Companies that have deliverable print or physical products along with their online presence require more setup, training and support, thus the additional investment. If you are eager to implement Pigeon into your site, or if you still have some questions you’d like to discuss with our team, send us a message and we’ll swiftly get back to you. Pigeon is the most flexible paywall system available. Be the first to hear about news and updates.